This is Part 2 of our Annual Report Blog Series. In Part 1, we posed 5 questions to get you started with your annual report planning. In this post, we’ll offer some suggestions on what to include and what not to include to help you create an annual report that informs and inspires. As we note in our newly published guide – Getting Started With Annual Reports – one of the biggest challenges you might face in preparing your annual report is finding a balance between reporting your organization’s accomplishments and information overload or TMI (too much information or detail). While you want to demonstrate all of the great work you’ve been doing throughout the year, it’s important to try to focus on a few key accomplishments which you can describe through examples, stories and visuals. Since I’ve produced annual reports and done a lot of “writing by committee” in my non-profit days, I know that it can also be challenging to manage all of the well-intentioned volunteers who want to contribute content or, perhaps worse, who want to simply offer opinions and editing services late in the process. While it is important to ensure you gain consensus around the key messages and content of the annual report, to maintain your schedule and your sanity, I suggest you strike an annual report advisory committee from the outset. Have one project manager, but gather a small “advisory group” who can brainstorm content and also help prioritize key messages as well as helping create a tight content list. It just might help as you move through the drafting and editing process if you’ve had sign-off from an advisory panel of Board members or communications volunteers. You should also identify the one or two folks (e.g., Executive Director and/or Board Chair) who will make the final content approval. What About the Financial Reporting? The type and amount of financial reporting in an annual report will depend on your organization type (e.g., charity, non-profit, association, club etc.) and your target audience. Kivi Leroux Miller reminds us that many readers are not familiar with annual reports so your financial section "should clearly explain where revenues come from and how they are spent. In addition to the information provided in traditional financial statements (abbreviated formats are fine in an annual report), it’s also helpful to include pie charts, bar graphs, or other visuals that help readers see the big picture and understand financial trends. A short narrative description is also essential. Explain in plain English the meaning behind all those numbers." As we also note in Getting Started With Annual Reports, the key difference between a non-profit or charity annual report and one for an association or membership organization is that you need to it to be “member-centered” rather than” donor-centred.” Instead of demonstrating how donations were spent, you need to outline the association or club’s accomplishments. And while the term is a little over-used, you need to illustrate “membership value.” Why should existing members feel proud of your organization? What accomplishments demonstrate a return-on-investment (ROI) of their membership dues or fees? What are non-members missing out on? Associations and membership organizations should also think in terms of telling your organization’s story. Using real live examples or quotes from members can have just as much impact for associations as it does for fundraising organizations. Include tangible examples of how the organization has benefited members throughout the year. You want to show them the outcomes of key initiatives, projects or committees and demonstrate the value these have added to their personal or professional lives through their membership. Like non-profits or charities, membership groups will also want to thank and recognize volunteers, partners and sponsors. This doesn’t mean simply listing all committees and their members – instead describe their work and acknowledge the individuals whose achievements have benefited the membership. Don’t broadcast everything you did last year – be concise and focus on a few accomplishments that relate to your mission. The next installment of our Annual Report Blog Series is: Telling Your Story Through Your Annual Report. Be sure to watch for this post on Wed. April 18. In the meantime, you can check out our new resources - Getting Started With Annual Reports and our Annual Report Checklist in our Membership Knowledge Hub. 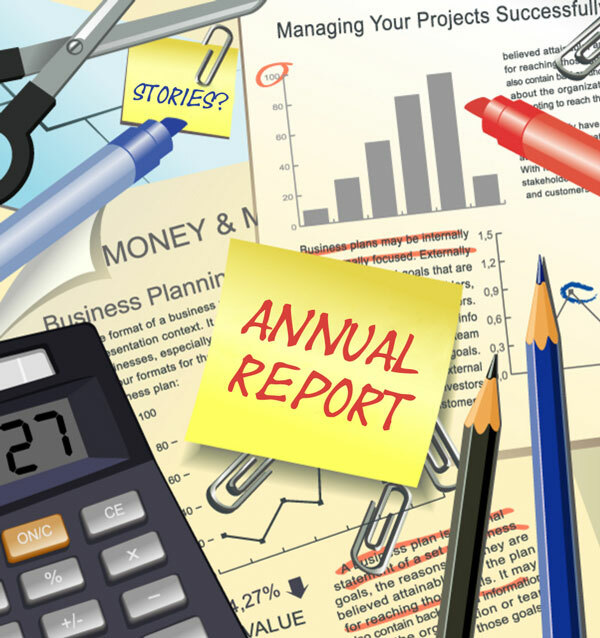 Do you have any additional advice for those who are new to annual reports? We’d love it if you’d share your tips and experiences in the comments below.